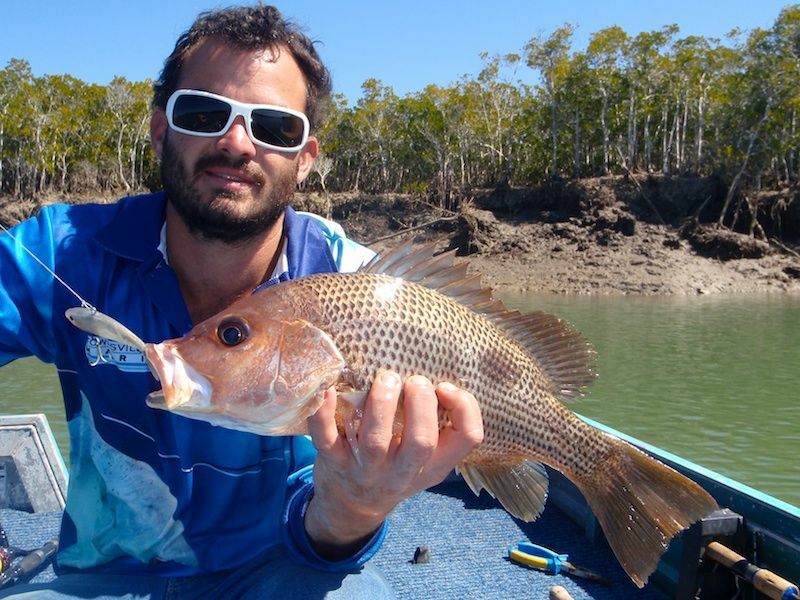 Yesterday Andrew and I headed off into one of the local creeks to target some Barramundi. We were planning the trip all week, but as the weekend predictions started to show mornings down in the 7 degree mark out expectations were not very high! But the tides were perfect and Andrew had a new Ci4 Stradic 3000 to test out, so we were going regardless. Andrew picked up me and my boat about 5.30 and we headed off. Boat was in by about 6.30 and we were soon rugged up and running across to our first location. 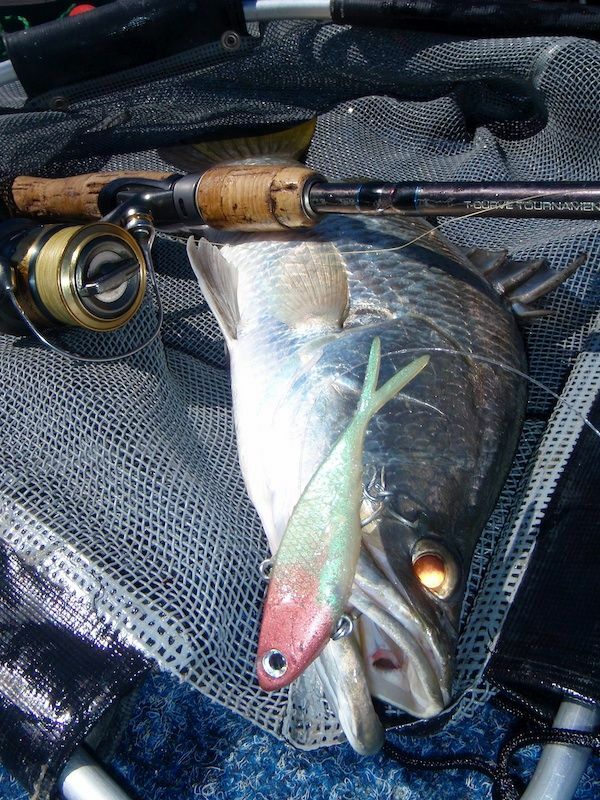 On a previous trip I had sounded up some good shows of bait in a deep 6m hole near the mouth of this particular creek. It took my interest at the time, but we never stopped to investigate. 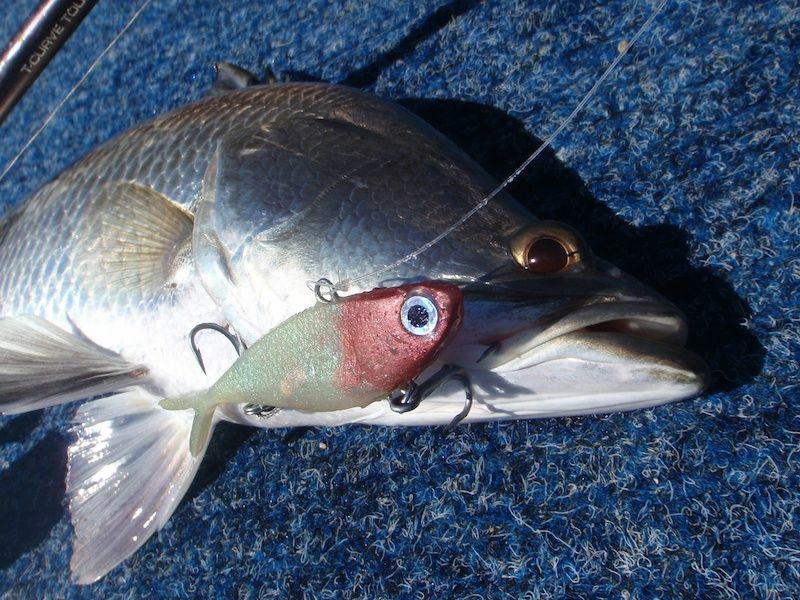 So today I thought we might drop some Thready Buster lures down and see what was holding with the bait. As we approached the sounder lit up! The iPilot was dropped and put into 'spot lock' mode directly above the school of fish. 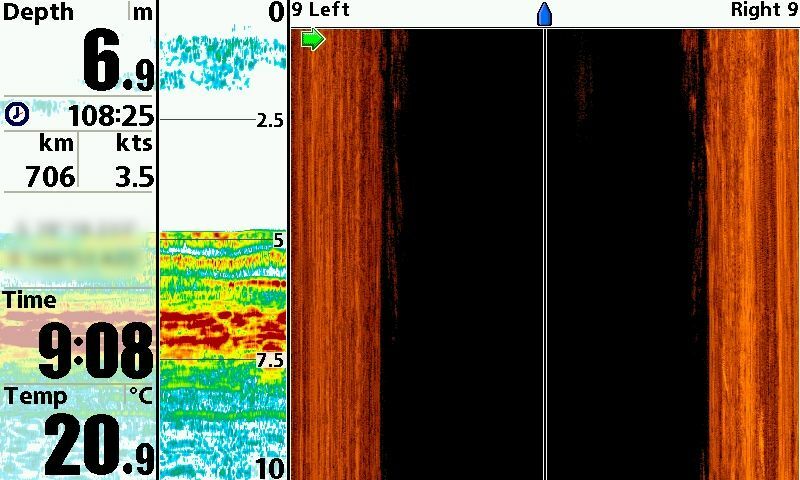 The sounder shot below is from a Humminbird 998 SI and shows what was marking in the hole. It didn't take too long and Thready Busters were being bumped left right and centre! The first fish was a nice Salmon to Andy, but I was soon connected to something much more substantial. I was using my older Sustain 1000fe and 8lb Power Pro. The fish slugged it out deep and I wasn't game to put on too much pressure. The Side Image of the 998 hadn't shown too much in the way of structure down there, so I was happy to let it play out. 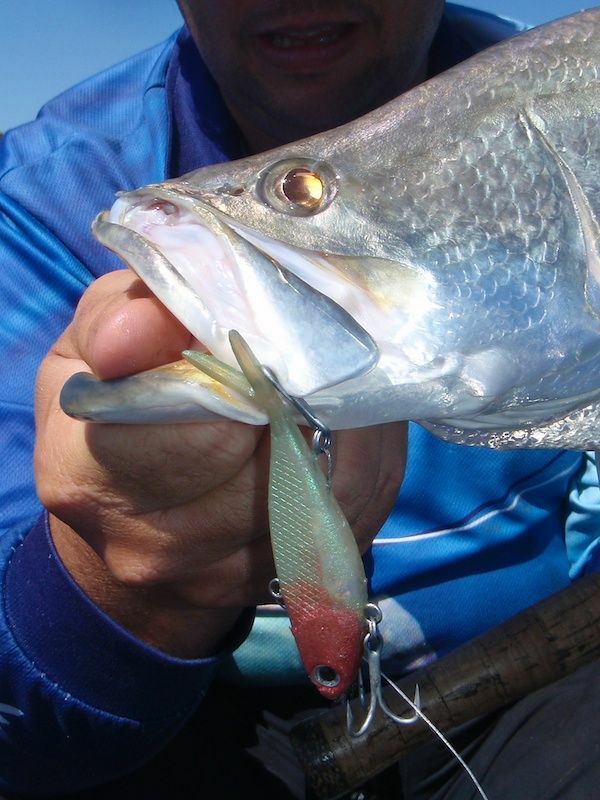 The fish never came to the surface for a jump, and the first flash of silver had me thinking big Grunter. But as the fish came better into sight it was soon apparent this was a nice Barra. A couple of final lunges and he was slipped into the waiting net. I didn't measure the fish as I was too keen to get another lure down. But we estimated it in the low 70's. We continued to work the Thready's for the next hour and experienced a pretty good session from the Salmon. We had double hookups on several occasions. 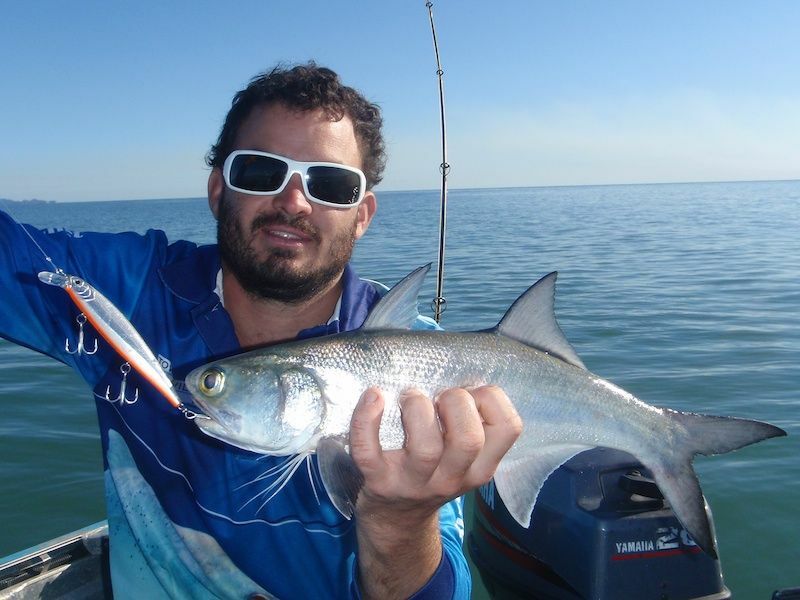 A few smaller Queenfish thrown in for good measure, but we didn't see another Barra. Andrew even nailed a few Salmon on the newly released 'Interceptor' hard bodied lure from Smoking Drags Co (the same guys who make the Thready Buster). It was very successful on these feisty little Salmon, and even seemed to get them fired up again just when they seemed to go quiet. The action was so consisted I put the GoPro on for a little video action. We left them biting and went in search of some timber to throw the lures at. 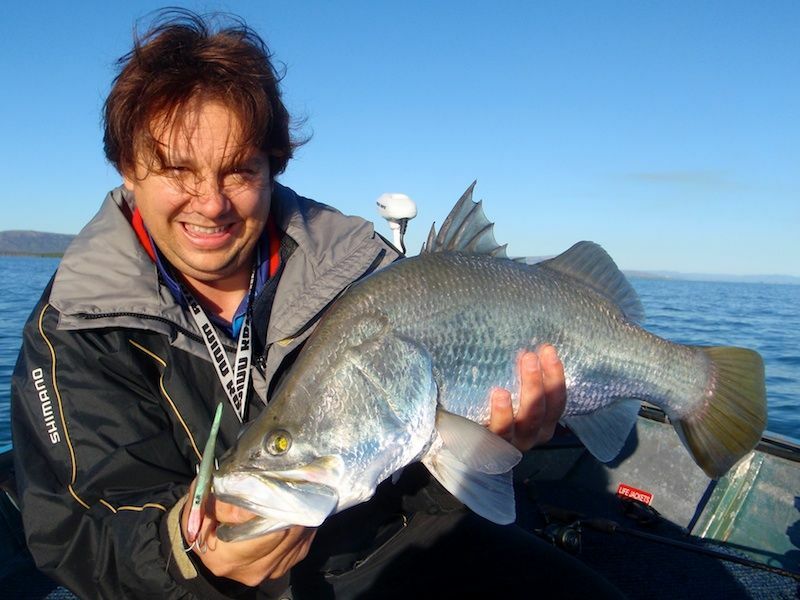 Barra were really the target species, and despite raising one we had given it a good shot for another. We managed a few Rats for the snags and the tide slowly fell, but it was quiet overall. On the bottom of the tide we decided to sit in another deep hole on the outside of a big bank and again work the Thready's. While the tide was dead we didn't see too much action, but as the tide began to run back in the fish came onto the bite. 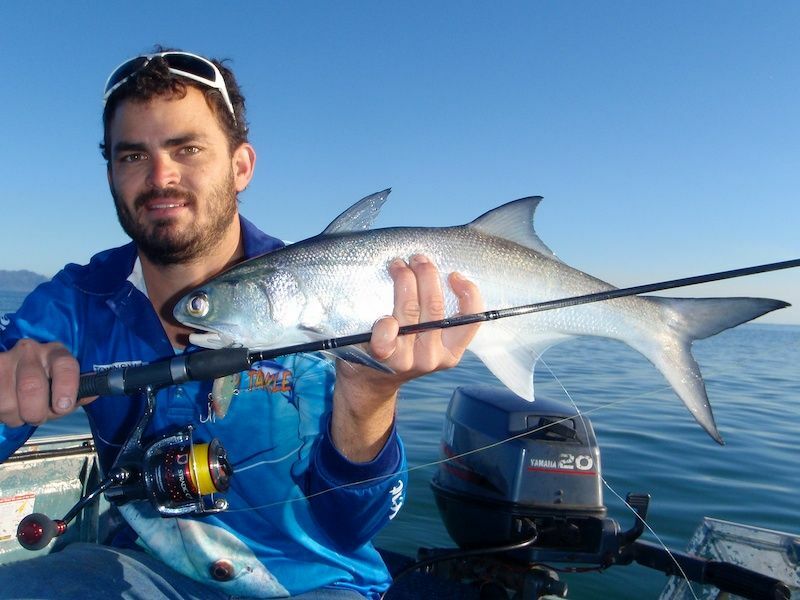 A number of smaller Barra were landed and Andrew nailed a nice Fingermark for the eski. But we also landed the usual by-catch of Cod, Salmon and small Jew. The best fish to come out of this hole was a 63cm Barra that took my TB. As the tide made we returned to the snags. But again just a handfull of rats kept us entertained for the afternoon. We called it quits about 4.30 and headed back to the ramp. We had had a day of both hot and cold sessions (weather too!). 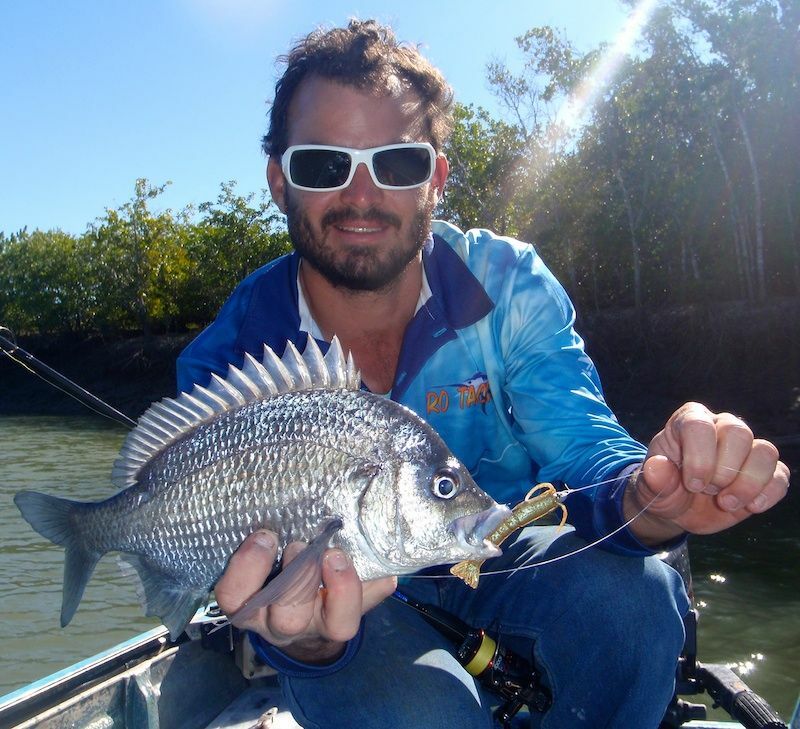 We had seen multiple hookups and fish a cast as well as long periods of no hits. But with out a doubt the Thready Buster lures fished in the deeper holes were deadly. Without this lure and this technique it would have been a very ordinary day. 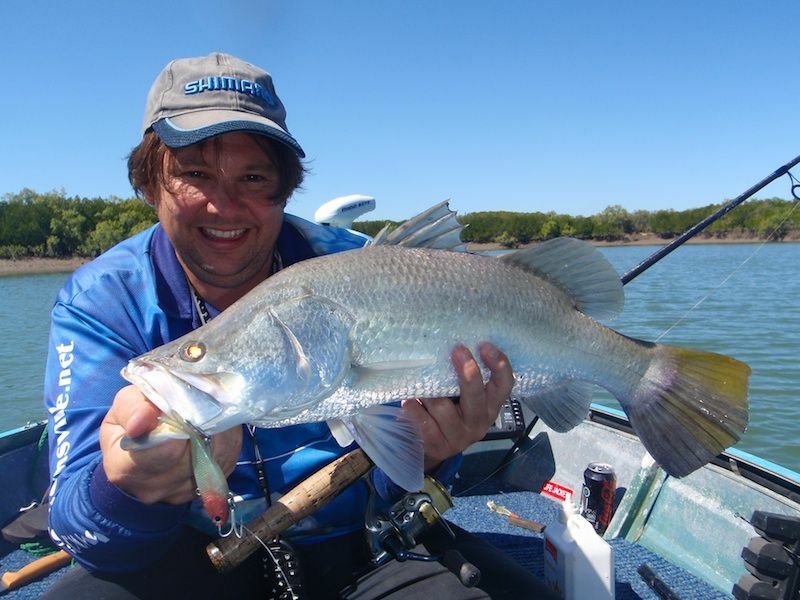 Species for the day included Barramundi, Jack, Salmon, Bream, Cod, Jew, Flathead, Archer and Fingermark. If you need to stock up on some Thready Buster lures then Pro Tackle have the best range at the best price. Go and have a chat to Matt about what he is catching on them and how to use them.